What a really interesting place this is, busy with people from all over the world, along with the atmosphere of gentleness and being at home with Santa. People had come here to write their Christmas cards. There were two Post Boxes, one for today and one for cards to arrive at Christmas. Then there was Santa's Office, where he replied to all mail sent to Santa. Santa has received around 12.5 million letters, from 197 different countries, he can get as many as 32,000 letters per day near to Christmas. 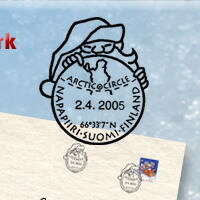 In Christmas 2007, Santa received and replied to over 700,000 letters. The envelopes are sold to raise money for UNICEF. 2 Euros for 30 envelopes. 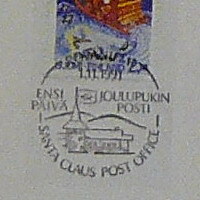 Here are ten postmarks used from Santa's Post Office. 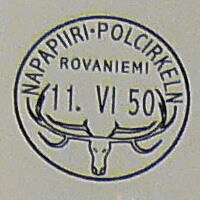 The first Finnish postmark with both date and picture was introduced in 1950, in a cottage near to the Arctic Circle near Rovaniemi. The postmark was in honour of the visit by Mrs Eleanor Roosevelt on 11th June 1950. 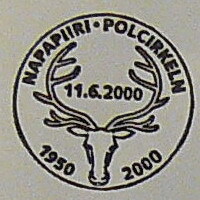 The pictorial motif of the postmark was the head of a reindeer with horns. 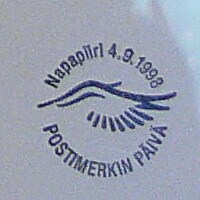 the text in a curve was "Napapiiri Polcirkeln" and horizontally "Rovaniemi" and the date. 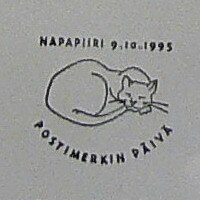 There are nine different versions of the postmark, five of which are the same except for the font, and small differences of size. 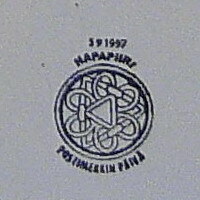 The sixth postmark has the words curved "Napapiiri Rovamiemi" and horizontally "Polcirkeln" and beneath that the date. 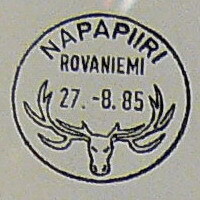 Since the seventh postmark the curved text is only "Napapiiri", with "Rovamiemi and the date written horizontally. Also there are minor differences in the head of the reindeer. 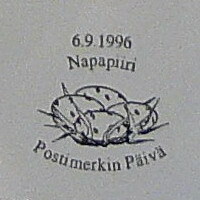 In the year 2000, to celebrate 50 years since the Roosevalt visit, a special postmark was used. In 2005, the Roosevelt cottage will celebrate its 55th anniversary. 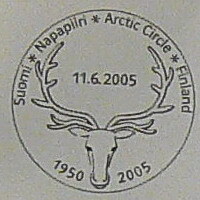 In honour of events from 11th to 13th June 2005, a special postmark will be used, being the original with some minor modifications.